Twisted Stitcher: It's May already? Okay, so my last post was nearly a month ago....time is going by so fast! I will try to sum up the things that have been happening. My daughter came back from college the first weekend in May. It is great to have her back, but man, you should have seen the load of stuff she brought with her. My son Matt and I had to take a second car up to school to get her, since all of her stuff wouldn't fit into the full size Bronco. The full size LTD was crammed full of stuff, too. It was like trying to fit the whole stash onto one shelf in my closet. While the girls were waiting for their RA to check them out of their room, I decided that the drive from Greeley to Fort Collins was short enough, and I had time enough to go here. The shop in the new books written by Maggie Sefton was based on this one. 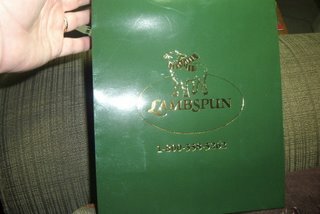 I didn't have much time there, only about a half hour, so I didn't have a big bag when I left. And the way that car was packed, I couldn't have fit much yarn in anyway. I did get a beautiful shawl pin and a small yarn pocket thing, which I hope is as convenient as I think it will be. 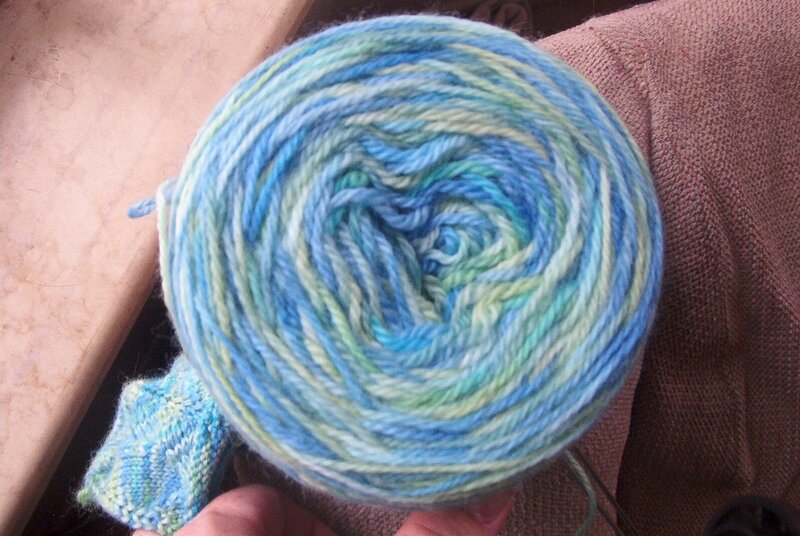 I plan on going back, hopefully as part of a Knitters with Altittude yarn crawl. Hint, hint you guys. I'm thinking late July sometime, preferably after we all forget how much we spent in Estes Park. 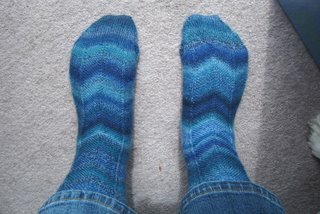 I have completed the blue Trekking socks, see.... I love them a lot. 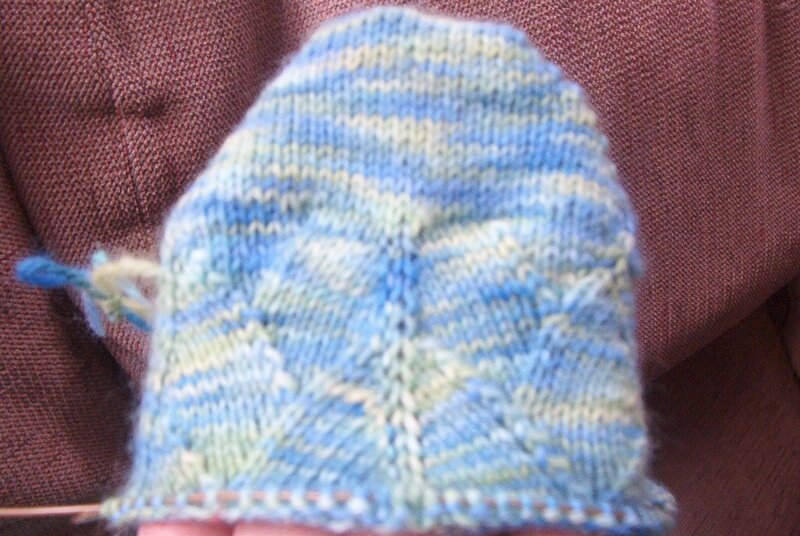 I did those on the "magic loop", top down, regular heel. This year, I am trying to decide what kind of sock knitting I like best. So hopefully I will get to them all (you can stop laughing now). I am going to try toe-up, top-down, two circs, magic loop, different types of toes and heels, that sort of thing. I've already done double points, which I like very much. I do like the magic loop a lot, too. Bonus points to that method for making it easy to figure out where I am when I pick up the sock after an interuption. I did cast on another pair of Trekking for working on at work. They are top down, magic loop as well. They are brown and I haven't decided what I'm going to do as far as pattern after the ribbing. On those I'm going to try a different heel and toe. I haven't figured out which one yet. These are made from some of the wool I dyed at knit group at Christies house. The pattern is from Barbara Walker's Second Treasury, page 136, Dragon Skin. I had to change it a little bit to make it fit into my stitch count. 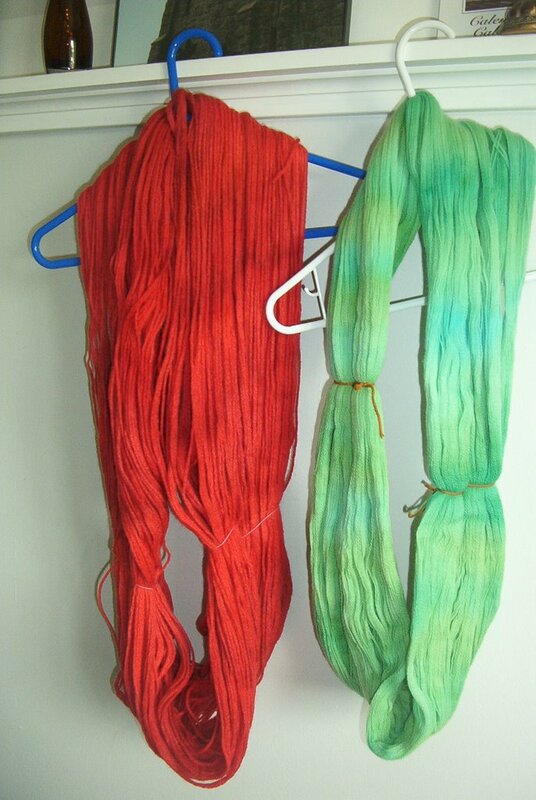 These are the other two skeins I dyed. The mostly green one is laceweight, the red is worsted. The red lost a lot of color is the rinsing, so I have been playing around with overdying the skein with assorted Kool Aid colors. I think the red one wants to be a felted bag. 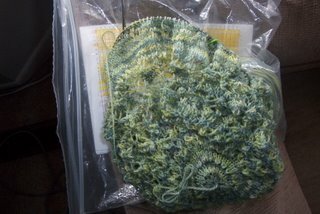 The laceweight is just laughing at me for thinking it will be knit up any time soon. 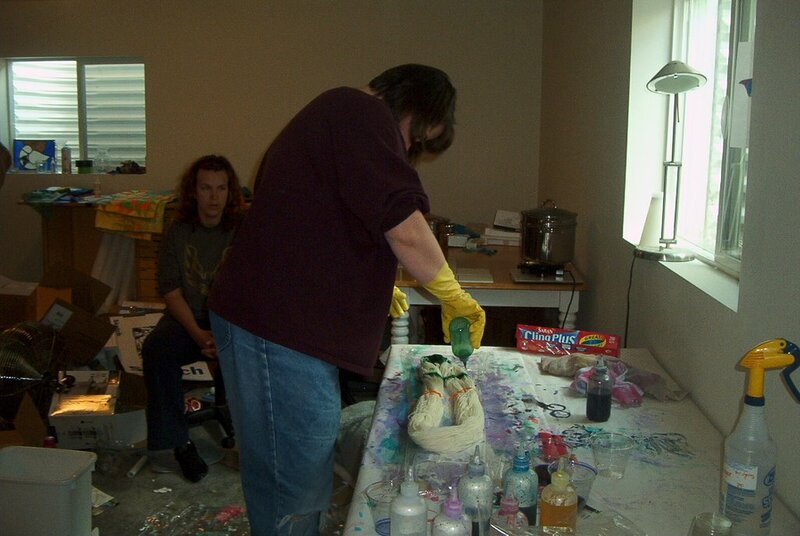 Here are pictures from the dye day at Christies and Ben's. 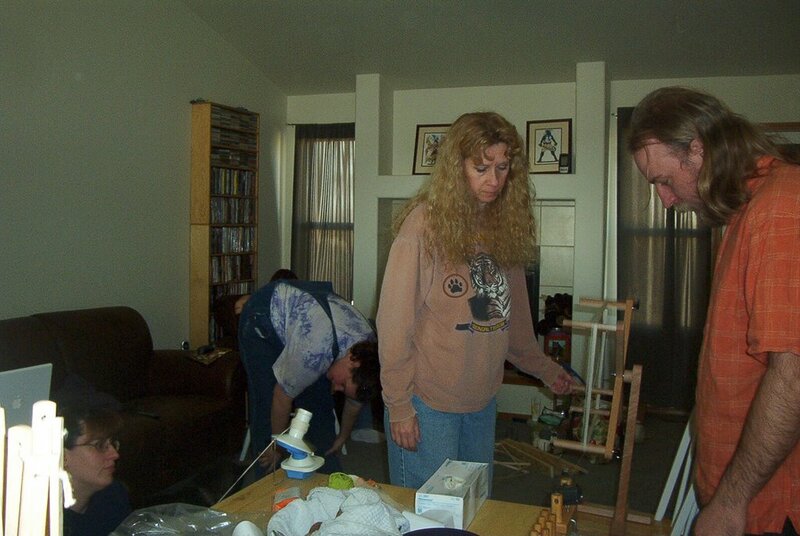 We are so grateful that they have the patience to have their home invaded by fiber-crazed, dye-happy Knitters. Thanks again, you two! From left to right, Ellen's yarn, Phoebe and her yarn, TOK's skeins. and MJ's creations. There was even more, but way too much to put here. And for those of you wondering about my mystery Pi shawl, here you go. It's not very much further along. Apparently, I am easily sidetracked by other projects. I really do plan on finishing it before August. And I am still hoping the miracle of blocking comes through for me on this. In other news, my son Mike came home from college on Friday. I was happy to see him. It's nice to have everybody back together. We learned that his football team will be playing in some kind of European football charity thing next May in Vienna. Austria. We are very excited, as you can imagine. They will be spending 9 days visiting Vienna and Prague. With any luck, my husband and I will be going, too! It will make a great 25th Anniversary trip. We are hoping that our younger son's High School graduation will not be on the same day. I'll find out tomorrow if the dates will all work out. Everyone keep your fingers crossed! I am still planning on going to the Estes Park Wool Festival in June. I'll be staying at a cabin there Friday and Saturday night. I could use some more roommates to split the cost. It should be a blast....an entire weekend around people who like fiber and understand why I do, too. As I said before, I'm hoping not to catch spinning fever there. We are also thinking about selling our house and moving to a place that will fit our lifestyle better now. 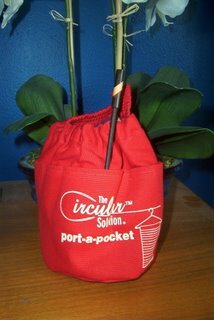 Read "we don't like doing maintenance and yard work, only partly because it cuts into knitting time" for "that will fit our lifestyle better", and you'll understand a little better. We are still waiting to see how the numbers are going to work out before any decisions are made. If you know anybody that wants our house, tell them to call me. 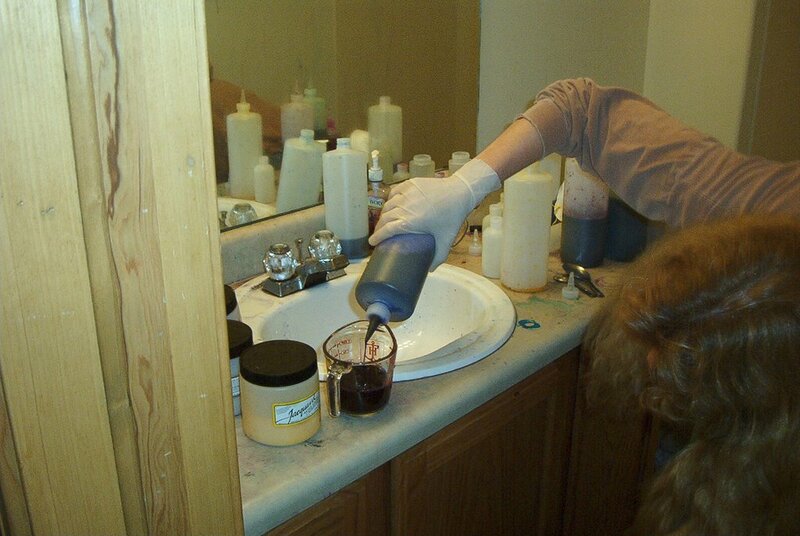 Great pictures of dye day too.